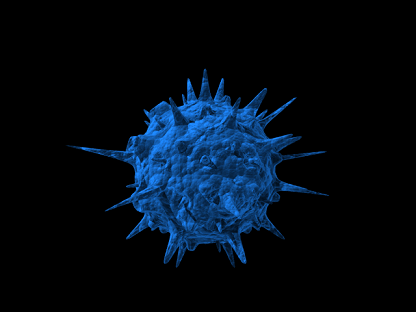 mkv25, mkv, virus, noisy, texture, electron, microscope, vision, lightwave, 3d, model, modelling, colours, design, artwork, infection, 28 days, later, blue, naming, website. This render, possibly, led me to create the name, of the website, mkv25.net. mkv25 blue. produced after mkv16 (orange). Looks like a virus to me. Its probably not that harmful, considering I rendered it using Lightwave 7. I found a good tutorial that showed me how to create a simple 3D model, then using noisy textures produce a electron microscope style image. The effect works very well.